In January 2004, President George W. Bush announced a new Vision for Space Exploration for the National Aeronautics and Space Administration (NASA) that would return humans to the Moon by 2020 in preparation for human exploration of Mars. As part of this vision, NASA would retire the Space Shuttle in 2010 and build and fly a new Crew Exploration Vehicle (CEV) no later than 2014. Initially, since no plans were made for this CEV to service the International Space Station (ISS), international partner assets would be required to ferry U.S. crew and cargo to the ISS after 2010 - creating a significant gap in domestic space access for U.S. astronauts. NASA gradually reorganized to better implement the President's vision and established the Exploration Systems Mission Directorate (ESMD) to lead the development of a new exploration "system-of-systems" to accomplish these tasks. Over the course of the next year, ESMD defined preliminary requirements and funded system-of-system definition studies by Government and industry. More than $1 billion in technology tasks were immediately funded in a wide variety of areas. Plans were established to spend more than $2 billion per year in exploration systems, human, and nuclear-related technologies. Plans were established to fund two CEV contractors through Preliminary Design Review (PDR) and first flight of a sub-scale test demonstration in 2008, after which selection of a final CEV contractor would be made. In March 2004, a CEV Request for Proposals (RFP) was released to industry despite the lack of a firm set of requirements or a preferred architecture approach for returning humans to the Moon. A wide variety of architecture options was still under consideration at that time - with none considered feasible within established budgets. Preferred architecture options relied on as many as nine launches for a single lunar mission and on modified versions of the United States Air Force (USAF) Evolved Expendable Launch Vehicles (EELVs) for launch of crew and cargo. Dr. Michael Griffin was named the new NASA Administrator in April 2005. With concurrence from Congress, he immediately set out to restructure NASA's Exploration Program by making it an immediate priority to accelerate the development of the CEV to reduce or eliminate the planned gap in U.S. human access to space. He established a goal for the CEV to begin operation in 2011 and to be capable of ferrying crew and cargo to and from the ISS. To make room for these priorities in the budget, Dr. Griffin decided to downselect to a single CEV contractor as quickly as possible and cancel the planned 2008 sub-scale test demonstrations. He also decided to significantly reduce the planned technology expenditures and focus on relatively low-tech, proven approaches for exploration systems development. 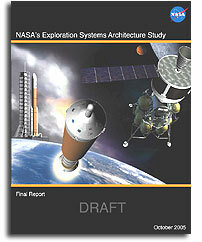 In order to reduce the number of required launches and ease the transition after Space Shuttle retirement in 2010, Dr. Griffin also directed the Agency to carefully examine the cost and benefits of developing a Shuttle-derived Heavy-Lift Launch Vehicle (HLLV) to be used in lunar and Mars exploration. To determine the best exploration architecture and strategy to implement these many changes, the Exploration Systems Architecture Study (ESAS) team was established at NASA Headquarters (HQ) as discussed below. Complete assessment of the top-level CEV requirements and plans to enable the CEV to provide crew transport to the ISS and to accelerate the development of the CEV and crew launch system to reduce the gap between Shuttle retirement and CEV Initial Operational Capability (IOC). Definition of top-level requirements and configurations for crew and cargo launch systems to support the lunar and Mars exploration programs. Development of a reference lunar exploration architecture concept to support sustained human and robotic lunar exploration operations. Identification of key technologies required to enable and significantly enhance these reference exploration systems and a reprioritization of near-term and far-term technology investments. Dr. Douglas Stanley of the Georgia Institute of Technology was asked to lead the ESAS effort. He selected two deputies to assist in the study: Steve Cook of the NASA Marshall Space Flight Center (MSFC) and John Connolly of the NASA Johnson Space Center (JSC). More than 20 core team members, listed in Appendix 2B, ESAS Core Team Members, were selected from various NASA field centers and industry and collocated at NASA HQ for the 3- month duration. Over the course of the ESAS effort, hundreds of employees from NASA HQ and the field centers were involved in design, analysis, planning, and costing activities. The ESAS effort was organized around each of the four major points of the charter. A NASA lead was established for each of the four areas: Wayne Peterson (JSC) - CEV definition, Steve Cook (MSFC) - Launch Vehicle (LV) definition, John Connolly (JSC) - lunar architecture definition, and Dr. Jay Falker (HQ) - technology plan definition. In addition, leads were also established on the core team for key analysis support areas such as: cost, requirements, ground operations, mission operations, human systems, reliability, and safety. A multi-Center CEV team was established to develop new CEV requirements and a preferred configuration to meet those requirements. The CEV requirements developed by the ESAS Requirements Team are contained in Appendix 2C, ESAS CEV Requirements. A wide variety of trade studies was addressed by the team. Different CEV shapes were examined, including blunt-body, slender-body, and lifting shapes. The required amount of habitable volume and number of crew were determined for each mission based on a crew task analysis. Economic-based trades were performed to examine the benefits of reusability and system commonality. The effects of a CEV mission to the ISS were examined in detail, including docking and berthing approaches and the use of the CEV as a cargo transport and return vehicle. The requirements for Extra-Vehicular Activity (EVA) were examined and different airlock approaches were investigated. Additional trades included: landing mode, propellant type, number of engines, level of engine-out capability, and abort approaches. A phased development approach was defined that uses block upgrades of the CEV system for ISS crew, ISS cargo, lunar, and Mars missions with the same shape and size system. An LV team, primarily from MSFC, examined hundreds of different combinations of launch elements to perform the various Design Reference Missions (DRMs). Different size LVs and numbers of launches required to meet the DRMs were traded. The LV team's major trade study was a detailed examination of the costs, schedule, reliability, safety, and risk of using EELV-derived and Shuttle-derived launchers for crew and cargo missions. Other trade studies included: stage propellant type, numbers of engines per stage, level of stage commonality, and number of stages. A multi-Center lunar architecture team was established to develop new architecture-level requirements and an overall architecture approach to meet those requirements. The architecture requirements developed by the ESAS Requirements Team are contained in Appendix 2D, ESAS Architecture Requirements. This team was also tasked with integrating the results of the other ESAS teams' efforts. An initial reference architecture was established and configuration control was maintained by the architecture team. Trade studies were then conducted from this initial baseline. In order to determine the crew and cargo transportation requirements, the team examined and traded a number of different lunar surface missions and systems and different approaches to constructing a lunar outpost. A team of nationally recognized lunar science experts was consulted to determine preferred locations for sortie and outpost missions. The use of in-situ resources for propellant and power was examined, and nuclear and solar power sources were traded. The major trade study conducted by the architecture team was an examination of various mission modes for transporting crew and cargo to the Moon, including: Lunar Orbit Rendezvous (LOR), Earth Orbit Rendezvous (EOR), and direct return from the lunar surface. The number and type of elements required to perform the Trans-Lunar Injection (TLI), Lunar-Orbit Insertion (LOI), and Trans-Earth Injection (TEI) burns associated with these missions were also traded. In addition, a number of different configurations were examined for the lunar lander, or Lunar Surface Access Module (LSAM). Trade studies for the LSAM included: number of stages, stage propellant and engine type, level of engine-out capability, airlock approaches, cargo capacity, and abort options. A multi-Center team was also established to determine the architecture technology requirements and to reprioritize existing technology plans to provide mature technologies prior to the PDR of each major element. The team used a disciplined, proven process to prioritize technology investments against architecture-level Figures of Merit (FOMs) for each mission. New technology investments were recommended only when required to enable a particular system, and investments were planned to begin only as required based on the need date. The various trade studies conducted by the ESAS team and each of the subteams used a common set of FOMs for evaluation. Each option was quantitatively or qualitatively assessed against the FOMs shown in Figure 1-1. FOMs are included in the areas of: safety and mission success, effectiveness and performance, extensibility and flexibility, programmatic risk, and affordability. FOMs were selected to be as mutually independent and measurable as possible. Definitions of each of these FOMs are provided in Appendix 2E, ESAS FOM Definitions, together with a list of measurable proxy variables and drivers used to evaluate the impacts of trade study options against the individual FOMs. A series of DRMs was established to facilitate the derivation of requirements and the allocation of functionality between the major architecture elements. Three of the DRMs were for ISS-related missions: transportation of crew to and from the ISS, transportation of pressurized cargo to and from the ISS, and transportation of unpressurized cargo to the ISS. Three of the DRMs were for lunar missions: transportation of crew and cargo to and from anywhere on the lunar surface in support of 7-day "sortie" missions, transportation of crew and cargo to and from an outpost at the lunar South Pole, and one-way transportation of cargo to anywhere on the lunar surface. A DRM was also established for transporting crew and cargo to and from the surface of Mars for a 6-month stay. The primary purpose of this mission is to transport three ISS crew members, and up to three additional temporary crew, to the ISS for a 6-month stay and return them safely to Earth at any time during the mission. The architecture elements that satisfy the mission consist of a CEV and a Crew Launch Vehicle (CLV). Figure 1-2 illustrates the mission. The CEV, consisting of a Crew Module (CM) and a Service Module (SM), is launched by the CLV into a 56-x-296-km insertion orbit at 51.6-degree inclination with a crew of three to six destined for a 6-month ISS expedition. The CEV performs orbit-raising burns per a pre-missiondefined rendezvous phasing profile to close on the ISS. These burns will be a combination of ground-targeted and onboard-targeted burns, the latter performed once rendezvous navigation sensors acquire the ISS. The CEV crew conducts a standard approach to the ISS, docking to one of two available CEV-compatible docking ports. The CEV crew pressurizes the vestibule between the two docked vehicles and performs a leak check. The ISS crew then equalizes pressure with the CEV vestibule and hatches are opened. Once ingress activities are complete, the CEV is configured to a quiescent state and assumes a "rescue vehicle" role for the duration of the crew increment. Periodic systems health checks and monitoring are performed by Mission Control throughout the increment. Upon completion of up to a 180-day increment on the ISS, the crew stows any return manifest items in the CEV crew cabin, performs a pre-undock health check of all entry critical systems, closes hatches and performs leak checks, and undocks from the station. The CEV departs the vicinity of the ISS and conducts an onboard-targeted (ground-validated) deorbit burn. After burn completion, the CEV SM is discarded, and the return component is maneuvered to the proper entry interface attitude for a guided entry to the landing site. The CEV performs a nominal landing at the primary landbased landing site. The primary purpose of this mission is to transport unpressurized cargo to the ISS and deorbit to perform a destructive reentry after 30 days at the ISS. The architecture elements that satisfy this mission consist of a Cargo Delivery Vehicle (CDV) and a CLV. Figure 1-3 illustrates the mission. The CDV is launched by the CLV into a 56-x-296-km insertion orbit at 51.6-degree inclination with an unpressurized carrier in place of the CEV CM loaded with up to 6,000 kg gross mass of external ISS logistics. The CDV performs orbit-raising burns per a pre-mission-defined rendezvous phasing profile to close on the ISS. These burns will be a combination of ground-targeted and onboard-targeted burns, the latter performed once rendezvous navigation sensors acquire the ISS. The CDV performs a standard approach to a safe stationkeeping point in the vicinity of the ISS. Upon validation of readiness to proceed by Mission Control, the CDV is commanded to proceed with approach and conducts a standard onboard-guided approach to the ISS, achieving a stationkeeping point within reach of the Space Station Remote Manipulator System (SSRMS). The ISS crew grapples the CDV and berths it to the Node 2 nadir Common Berthing Mechanism (CBM) port. Once berthing activities are complete, the CDV systems are configured to a quiescent state. The ISS crew performs logistics transfer and systems maintenance EVAs to offload the CDV unpressurized pallet of new Orbital Replacement Units (ORUs) and to load old ORUs for disposal. Periodic systems health checks and monitoring are performed by Mission Control throughout the increment. Upon completion of up to a 30-day mated phase on the ISS, Mission Control performs a pre-undock health check of all entry critical systems. Then the ISS crew grapples the CDV, unberths it from the CBM, and maneuvers it to its departure point and releases it. The CDV departs the vicinity of the ISS and conducts an onboard-targeted (ground-validated) deorbit burn for disposal. The primary purpose of this mission is to transport pressurized cargo to the ISS and deorbit to perform a reentry and safe return of pressurized cargo to Earth after 90 days at the ISS. Figure 1-4 illustrates the mission. The architecture elements that satisfy this mission consist of a cargo version of the CEV and a CLV. A cargo version of the CEV is launched by the CLV into a 56-x-296-km insertion orbit at 51.6-degree inclination with the pressurized module filled with up to 3,500 kg gross mass of pressurized logistics for delivery to the ISS. The CEV performs orbit-raising burns per a pre-mission-defined rendezvous phasing profile to close on the ISS. These burns will be a combination of ground-targeted and onboard-targeted burns, the latter performed once rendezvous navigation sensors acquire the ISS. The uncrewed CEV performs a standard approach to a safe stationkeeping point in the vicinity of the ISS. Upon validation of readiness to proceed by Mission Control, the CEV is commanded to proceed with approach and conducts a standard onboard-guided approach to the ISS, docking to one of two available CEV-compatible docking ports. Mission Control pressurizes the vestibule between the two docked vehicles and performs a leak check. The ISS crew then equalizes with the CEV and hatches are opened. Once ingress activities are complete, the CEV systems are configured to a quiescent state and the CEV cargo is off-loaded. Periodic systems health checks and monitoring are performed by Mission Control throughout the increment. Upon completion of up to a 90-day docked phase on the ISS, the crew stows any return manifest items in the CEV pressurized cabin, Mission Control performs a pre-undock health check of all entry critical systems, the ISS crew closes hatches and performs leak checks, and Mission Control commands the CEV to undock from the station. The CEV departs the vicinity of the ISS and conducts an onboard-targeted (ground-validated) deorbit burn. After burn completion, unnecessary CEV elements are discarded, and the return element is maneuvered to the proper entry interface attitude for a guided entry to the landing site. The CEV performs a nominal landing at the primary land-based landing site. The architecture provides the capability for up to four crew members to explore any site on the Moon (i.e., global access) for 4 to 7 days. These missions, referred to as lunar sorties, are analogous to the Apollo surface missions and demonstrate the capability of the architecture to land humans on the Moon, operate for a limited period on the surface, and safely return them to Earth. Sortie missions also allow for exploration of high-interest science sites or scouting of future lunar outpost locations. Such a mission is assumed not to require the aid of pre-positioned lunar surface infrastructure, such as habitats or power stations, to perform the mission. During a sortie, the crew has the capability to perform daily EVAs with all crewmembers egressing from the vehicle through an airlock. Performing EVAs in pairs with all four crewmembers on the surface every day maximizes the scientific and operational value of the mission. Figure 1-5 illustrates the lunar sortie crew and cargo mission. The following architecture elements are required to perform the mission: a CLV, a Cargo Launch Vehicle (CaLV) capable of delivering at least 125 mT to Low-Earth Orbit (LEO), a CEV, an LSAM, and an Earth Departure Stage (EDS). The assumed mission mode for the lunar sortie mission is a combination EOR-LOR approach. 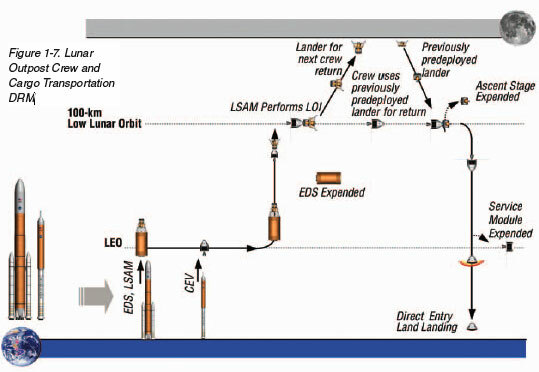 The LSAM and EDS are pre-deployed in a single CaLV launch to LEO, and the CLV delivers the CEV and crew in Earth orbit, where the two vehicles initially rendezvous and dock. The EDS performs the TLI burn and is discarded. The LSAM then performs the LOI for both the CEV and LSAM. The entire crew then transfers to the LSAM, undocks from the CEV, and performs a descent to the lunar surface in the LSAM. After a 4- to 7-day surface stay, the LSAM returns the crew to lunar orbit where the LSAM and CEV dock, and the crew transfers back to the CEV. The CEV then returns the crew to Earth with a direct entry and land touchdown, while the LSAM is disposed of via impact on the lunar surface. The architecture provides the capability to deliver 20 mT of cargo to the lunar surface in a single mission using the elements of the human lunar transportation system. This capability is used to deliver surface infrastructure needed for lunar outpost buildup (habitats, power systems, communications, mobility, In-Situ Resource Utilization (ISRU) pilot plants, etc. ), as well as periodic logistics resupply packages to support a continuous human presence. Figure 1-6 illustrates the lunar outpost cargo delivery mission. 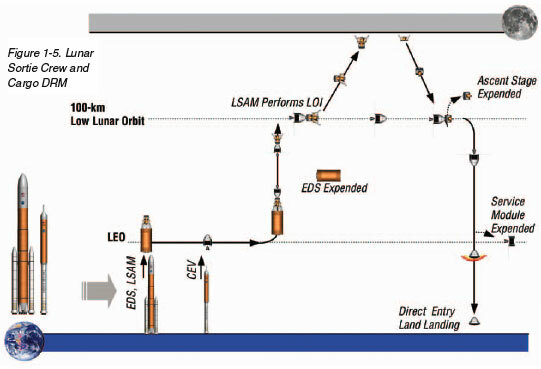 The following architecture elements are required to perform the mission: the same CaLV and EDS as the sortie mission, and a cargo variant of the LSAM to land the large cargo elements near the lunar outpost site. The cargo variant of the LSAM replaces the habitation module with a cargo pallet and logistics carriers. 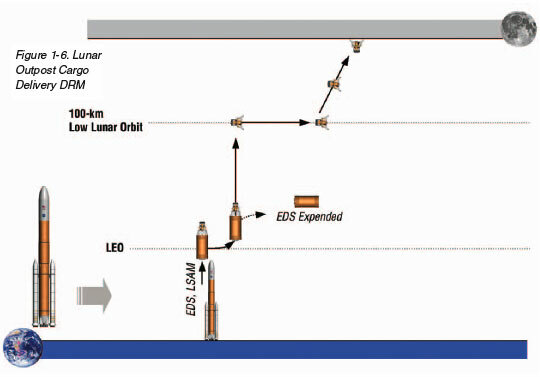 The LSAM and EDS are launched to LEO on a single CaLV. The EDS performs the TLI burn and is discarded. The LSAM then performs the LOI and a descent to the lunar surface. The cargo is then off-loaded from the LSAM autonomously or by the outpost crew. A primary objective of the lunar architecture is to establish a continuous human presence on the lunar surface to accomplish exploration and science goals. This capability will be established as quickly as possible following the return of humans to the Moon. To best accomplish science and ISRU goals, the outpost is expected to be located at the lunar South Pole. The primary purpose of the mission is to transfer up to four crew members and supplies in a single mission to the outpost site for expeditions lasting up to 6 months. Every 6 months, a new crew will arrive at the outpost, and the crew already stationed there will return to Earth. Figure 1-7 illustrates this mission. The entire suite of vehicles developed to support lunar sortie exploration is also required for lunar outpost missions, in addition to a surface habitat, power/communications systems, and other infrastructure elements still to be defined. The following architecture elements are required to perform the mission: a CLV, a CaLV capable of delivering at least 125 mT to LEO, a CEV, an LSAM, and an EDS. The assumed mission mode for the lunar sortie mission is a combination EOR-LOR approach. The LSAM and EDS are pre-deployed in a single CaLV launch to LEO, and the CLV delivers the CEV and crew in Earth orbit, where the two vehicles initially rendezvous and dock. The EDS performs the TLI burn and is discarded. The LSAM then performs the LOI for both the CEV and LSAM. The entire crew then transfers to the LSAM, undocks from the CEV, and performs a descent to the lunar surface near the outpost in the LSAM. After a surface stay of up to 6 months, the LSAM returns the crew to lunar orbit where the LSAM and CEV dock, and the crew transfers back to the CEV. The CEV then returns the crew to Earth with a direct entry and land touchdown, while the LSAM is disposed of via impact on the lunar surface. The Mars Exploration DRM employs conjunction-class missions, often referred to as long-stay missions, to minimize the exposure of the crew to the deep-space radiation and zero-gravity environment while, at the same time, maximizing the scientific return from the mission. This is accomplished by taking advantage of optimum alignment of Earth and Mars for both the outbound and return trajectories by varying the stay time on Mars, rather than forcing the mission through non-optimal trajectories, as in the case of the short-stay missions. This approach allows the crew to transfer to and from Mars on relatively fast trajectories, on the order of 6 months, while allowing them to stay on the surface of Mars for a majority of the mission, on the order of 18 months. The surface exploration capability is implemented through a split mission concept in which cargo is transported in manageable units to the surface, or Mars orbit, and checked out in advance of committing the crews to their mission. The split mission approach also allows the crew to be transported on faster, more energetic trajectories, minimizing their exposure to the deep-space environment, while the vast majority of the material sent to Mars is sent on minimum energy trajectories. An overview of the mission approach is shown in Figure 1-8. 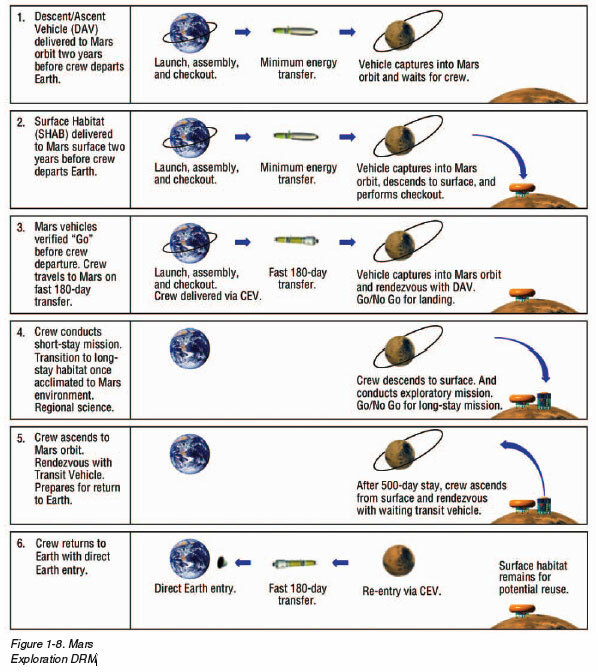 As can be seen in Figure 1-8, each human mission to Mars is comprised of three vehicle sets, two cargo vehicles, and one round-trip piloted vehicle. The scope of the ESAS was only to address the transportation of the crew to and from a Mars Transfer Vehicle (MTV) in LEO and to provide the design of a CaLV with a LEO cargo capacity of 125 mT. This DRM utilizes the CEV to transfer a crew of six to and from an MTV as part of a Mars mission architecture. The CEV is launched by the CLV into an orbit matching the inclination of the MTV. The CEV spends up to 2 days performing orbit raising maneuvers to close on the MTV. The CEV crew conducts a standard approach to the MTV and docks. The CEV crew performs a leak check, equalizes pressure with the MTV, and opens hatches. Once crew and cargo transfer activities are complete, the CEV is configured to a quiescent state. Periodic systems health checks and monitoring are performed by Mission Control throughout the Mars transfer mission. As the MTV approaches Earth upon completion of the 2.5-year mission, the crew performs a pre-undock health check of all entry critical systems, transfers to the CEV, closes hatches, performs leak checks, and undocks from the MTV. The CEV departs the MTV 24 hours prior to Earth entry and conducts an onboard-targeted (ground-validated) deorbit burn. As entry approaches, the CEV maneuvers to the proper entry interface attitude for a direct guided entry to the landing site. The CEV performs a nominal landing at the primary land-based landing site.